Railings and finial of cast iron, with traces of brown-black, black, dark grey, red-brown, grey, dark grey brown, light brown, bright red ochre, red ochre, red/white lead, dark brown, green (vivid), orange brown, sparkly grey, dark red ochre, very pale grey and rust. 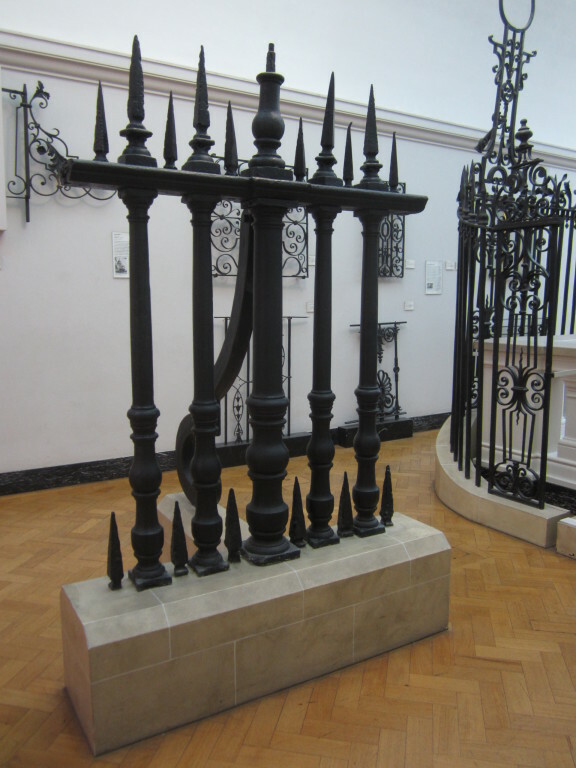 With the railings around the Senate in Cambridge, and those around St Martin's-in-the- Fields, these are some of the earliest English cast iron railings known. They are said to have been made by the foundry at Lamberhurst, Sussex. (See, E. Straker, Wealden Iron, p.272). According to the accounts in the Cathedral Library they were delivered between September 13th 1710 and June 10th 1714, and payment was made to, "Richard Jones Smith, of a sum of £11,202 0s 6d, being for 200 tons 2 quarters 25lbs, at 6d per lb". (See, E. Straker, p.207). Wren, the cathedral's architect, apparently wanted neither a fence around the building, nor if there had to be one, that it should be of cast rather than wrought iron. He was however, over-ruled by the Whig-biased Rebuilding Commission, at whose suggestion Richard Jones had tendered. On September 20th, 1710, Jones was paid £1,000 on account for the fence; Wren attended no further meetings of the Commission. (See, Judith Hook, The Baroque Age in England", p.101, and The Wren Society, xvi, p.149). Robertson, E. G. and Joan Robertson. Cast Iron Decoration, A World Survey. London : Thames and Hudson, 1977. pl.33, p.16. Hook, Judith. The Baroque Age in England. p.101. Bosomworth, Dorothy. Railings Revived. Traditional Homes. 1985. pp.42-48. 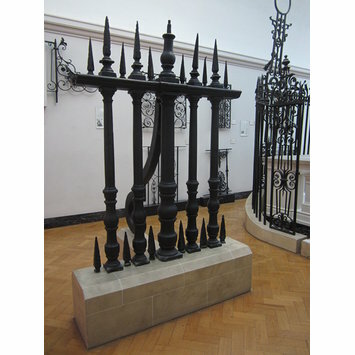 With the railings around the Senate in Cambridge, and those around St Martin's-in-the-Fields, these are some of the earliest English cast iron railings known. They are said to have been made by the foundry at Lamberhurst, Sussex. (See, E. Straker, Wealden Iron, p.272). According to the accounts in the Cathedral Library they were delivered between September 13th 1710 and June 10th 1714, and payment was made to, "Richard Jones Smith, of a sum of £11,202 0s 6d, being for 200 tons 2 quarters 25lbs, at 6d per lb". (See, E. Straker, p.207). Wren, the cathedral's architect, apparently wanted neither a fence around the building, nor if there had to be one, that it should be of cast rather than wrought iron. He was however, over-ruled by the Whig-biased Rebuilding Commission, at whose suggestion Richard Jones had tendered. On September 20th, 1710, Jones was paid £1,000 on account for the fence; Wren attended no further meetings of the Commission. (See, Judith Hook, The Baroque Age in England", p.101, and The Wren Society, xvi, p.149).